Retiring early is a dream many Americans have. But given all the complications of planning any retirement, let alone an early one, retiring early rarely becomes a reality for most Americans. One way to increase the probability that you can afford to retire a few years early is to settle in a state with a low cost of living. If you combine that with a savvy investment plan that a financial advisor designs for you, you can give yourself a pretty good shot at retiring ahead of schedule. Below, we look at these and other factors to rank the best states for an early retirement. In order to rank the best states for an early retirement, we examined data on seven factors. We looked at effective tax rates, health insurance costs, non-housing cost of living, housing costs, property tax rates, doctor’s offices per 10,000 residents and entertainment establishments per 10,000 residents. Check out our data and methodology below to see where we got our data and how we put it together to create our final rankings. Great Plains score well - The Northern Great Plains states - South Dakota, North Dakota and Wyoming - all score well. These states tend to come with low costs of living, a major ingredient in a successful early retirement. Cold retirement - Not all the states that cracked the top 10 are warm retiree paradises. Our top 10 is split about 50/50 between places that are temperate and those that are cold. 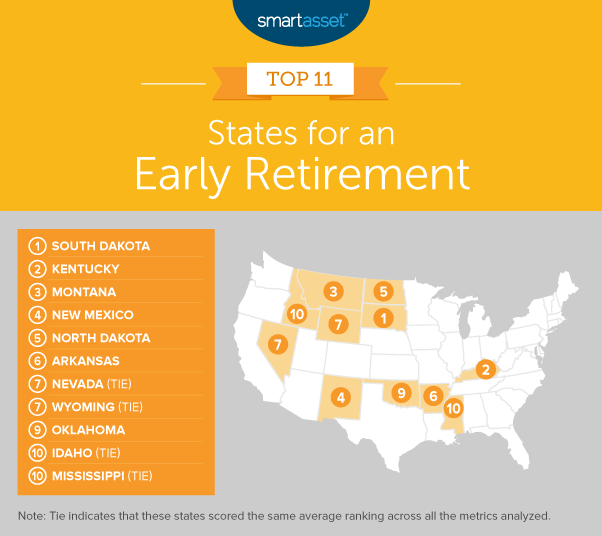 South Dakota tops the list as the best state for an early retirement. This state has one of the lowest effective tax rates at 13.71% and the lowest non-housing cost of living in the country. Even housing costs here won’t negatively affect your retirement plans too badly. The annual cost of housing in South Dakota is just under $9,300. If you’re worried about what you’re going to do in retirement, you'll be glad to hear South Dakota is packed with entertainment. This state ranks second in entertainment establishments per 10,000 residents. The Bluegrass State takes second. The best way to stretch your retirement savings is to move to an affordable locale, and for that reason, Kentucky ranks very well. In both housing costs and non-housing cost of living, Kentucky ranks in the top five. This state also ranks in the top 25 for property tax rate and health insurance cost. All told, Kentucky is a great place to take an early retirement. Montana is attractive as a place to retire early, because it has one of the lowest effective tax rates in the country, thanks in large part to the lack of sales tax. Property taxes are also on the low side, meaning if you own a home here, your housing costs should be pretty low. Big Sky Country falls a bit behind the states ranked above, because the non-housing cost of living is slightly on the high side. Like South Dakota, Montana is perhaps more fun than the average person imagines. Partially due to its low population, Montana ranks first in entertainment establishments per 10,000 residents. Retirees generally have a preference for warm weather. That's why Arizona and Florida traditionally rank as the top destinations for retirees. New Mexico is another warm destination, but we rank it as a great place for an early retirement because of its affordability. This state ranks ninth in housing costs and in the top 25 for the non-housing cost of living and health insurance. Two concerns for people retiring here may be the lack of doctor’s offices relative to the local population and the dearth of entertainment establishments. New Mexico ranks 39th or worse in those two metrics. Both of the Dakotas crack the top five. North Dakota has the eighth-lowest effective tax rate in our study. Along with the low taxes, the housing costs in North Dakota are low. Using Census Bureau data, we estimate the annual cost of housing to be under $9,600 per year. Property taxes are on par with the national average, so long-term homeownership won’t lower the cost of housing by too much. Finally, North Dakota ranks ninth for entertainment establishments per 10,000 residents. The Natural State ranks sixth, although the sales tax rates are some of the highest in the nation. The average state and local sales tax rates come to 9.3%. But the cost of living here is very low. We estimate the non-housing cost of living to be less than $18,000 per year and the annual cost of housing to be $8,300. In both of those metrics, Arkansas ranks third. Property taxes here are also among the lowest in the nation. That means if you manage to pay off your mortgage here, you can really limit housing costs. Homeowners here also get access to the homestead tax credit, which is worth $350 for homeowners whose principal home is in Arkansas. Nevada takes the all-around approach to claim a top-10 spot. Across all of our metrics, Nevada ranks no worse than 34th, including ranking in the top 25 for six out of our seven metrics. This state’s best scores came in the number of doctor’s offices per 10,000 residents and property taxes. In both metrics, Nevada ranks in the top 10. That makes this a great state for long-term homeowners who want easy access to their doctors. Wyoming is tied with Nevada for seventh. The Cowboy State is one of the most tax-friendly states for retirees: Social Security isn’t taxed, nor are withdrawals from retirement accounts. In addition to its tax-friendliness, Wyoming also ranks above average for both housing and non-housing cost of living. Health insurance, however, can get expensive here, a fact that hurts the state's overall ranking. The Sooner State comes in ninth. With annual housing costs at slightly more than $9,200 per year and non-housing cost of living under $18,000, it is not too hard to imagine ending your working life and enjoying a long, financially secure retirement in Oklahoma. This state ranks in the top six for both of those metrics. Oklahoma also ranks in the top 25 for both of our tax metrics. When it comes to medical access, Oklahoma isn’t bad either. This state has 6.8 doctor’s offices per 10,000 residents, a top 20 rate. With only one metric ranking below average, Idaho makes a strong case as a place to settle down for an early retirement. Housing costs here tally just under $10,600, according to Census Bureau estimates. If you’re a long-time resident of Idaho and have paid off your mortgage, your housing costs will be even lower. Idaho ranks 14th for average effective property tax rate at 0.68%. Last but not least, it’s Mississippi. In pure cost-of-living terms, Mississippi is one of the best places for an early retirement. The average home costs just $8,100 per year, while non-housing costs reach just $18,400. Even property taxes are low and health insurance won’t bankrupt you. So why did Mississippi barely crack the top 10? This state ranks very low in both entertainment establishments per 10,000 residents and doctor’s offices per 10,000 residents. Average effective tax rate. To find this number, we calculated tax rates based on a retiree earning $35,000 annually (from retirement savings, Social Security or part-time employment) and spending his or her disposable income on taxable goods. Health insurance costs. This is the average annual cost of a silver health insurance plan. We used the Kaiser Family Foundation’s health insurance calculator to calculate this. Using this tool, we estimated the cost of a silver plan for 60-year-olds across the five largest counties in each state. Average annual housing costs. Data comes from the Census Bureau’s 2017 1-year American Community Survey. Average effective property tax rate. Data comes from the Census Bureau’s 2017 1-year American Community Survey. Doctor's offices per 10,000 residents. Data comes from the Census Bureau’s 2016 Business Patterns Survey. Arts, entertainment and recreation establishments per 10,000 residents. Data comes from the Census Bureau’s 2016 Business Patterns Survey. First, we ranked each state in each metric. Then we found each state’s average ranking and gave a double weight to the average effective tax rate and a double weight to median annual housing costs. All other metrics received a single weight. We used this average ranking to create our final score. The city with the best average ranking received a 100, and the city with the lowest average ranking received a 0. Save early - It is the most obvious piece of advice but also the most important. By consciously investing money early, even if you only start investing small sums, you eventually unlock the benefits of compound interest. Cut costs - It may be hard to replace all your pre-retirement income while you live out your golden years. So one way to stretch your retirement income is to move somewhere affordable. Above, we rank some of the best states for an early retirement, but you may also want to check out our cost of living calculator to find a place that makes sense for you. Invest wisely - If you don’t want to stress over whether you're making the right investments, you may want to have a financial advisor strategize for you. To find the best, local financial advisor, check out SmartAsset’s financial advisor matching tool. It will match you with up to three local financial advisors who fit your specific needs.